I don’t know George. But I think I would like to. You see, George does it all. Who doesn’t need a man like that around the house? 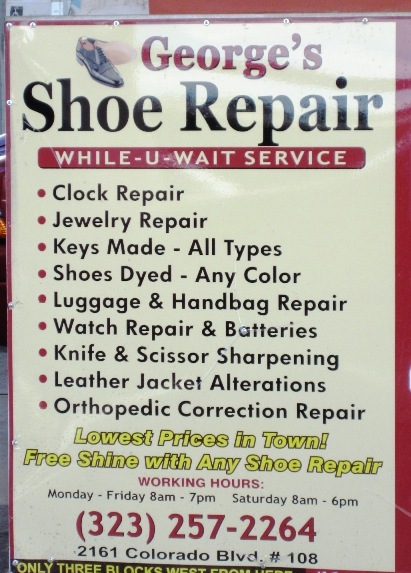 When was the last time you had a pair of shoes repaired? While-U-Wait! He can dye your shoes to match your new outfit or your pet maybe. He can make a key for your new roomate. He makes sure you stay on time with a new watch battery. Feeling a little dull. He can sharpen your knives. If the sign had been bigger I bet there are whole lot more things that George could do. Maybe its a good thing the sign isn’t bigger. There might be things he can do I don’t want to know about or aren’t fit for a public sign. All of this and he guarantees he has the lowest prices in town. I repeat who wouldn’t like a man like him? Sorry folks, he is in California not Seattle.